SCR-HD is a playable character and the primary antagonist for Sonic Riders: Zero Gravity on the Wii and the PlayStation 2. An Eggman robot produced by Meteor Tech, SCR-HD goes insane after coming into contact with the Arks of the Cosmos, eventually transforming into the twisted Master Core: ABIS aboard Astral Babylon. The robot is destroyed by Sonic the Hedgehog during the game's final level, Mobius Strip. The robot races without using Extreme Gear, instead curling up into a wheel configuration and blazing forwards under its own power. In cutscenes it is shown with the ability to fly. In Zero Gravity, Dr. Eggman has established the Meteor Tech robotics corporation as a front for his activities in the high-technology region of Monopole. Described as "the leading security company" in the game's opening sequence, Meteor Tech produces SCR-HD and SCR-GP model 'bots in its MeteorTech Sparkworks, and controls them from Crimson Tower via the Mother Computer. It seems to have been Eggman's plan to sell his (apparently harmless) robots to various other organizations around Monopole, saturating the economy with Meteor Tech models, and then later seize control of the region in one fell swoop by setting the machines to rampage. Eggman's plan is derailed before the game begins, not by Sonic, but by beings long dead. Somewhat unwisely, Eggman used an ill-understood piece of ancient Babylonian technology - discovered in Crimson Crater - as the core of his Mother Computer. When an Ark of the Cosmos crashes as a meteorite outside Crimson Tower, the SCR robots go berserk, compelled by the malfunctioning mainframe to gather all 5 Arks and bring them to Babylon Garden. SCR-HD seems to take the lead over hordes of SCR-GP robots in this search, being the tenacious model who pursues Amy and Storm in Aquatic Capital, and finally captures the Arks after Security Corridor at the end of the Babylon story. The reaction between the Arks and Babylon Garden unleashes the "Lightless Black", destroying the Garden and transforming SCR-HD into a giant grotesquely of a final boss, Master Core: ABIS. SCR-HD in-game, on the starting line of Crimson Crater. Unlocking: While SCR-GP becomes playable in Free Race as soon as the Babylon Story has been completed, SCR-HD requires luck to unlock. When playing a standard Free Race (on any track), SCR-HD will appear as an opponent on the starting line-up at random intervals. He can be most easily distinguished from SCR-GP by his character icon, which is colored gold rather than silver. Play through the Free Race as normal, and if you beat SCR-HD he becomes a playable character. "SCR-HD" may or may not refer to a unique robot as opposed to a whole model line; the game is never absolutely clear on this point. 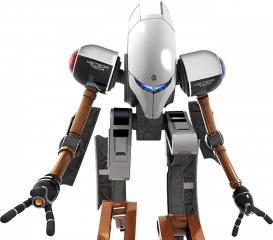 The SCR models' white-painted, humanoid appearance seems to derive from the Egg Gunner design from Sonic '06. It can often be difficult to distinguish between SCR-GP and SCR-HD. During gameplay, HD's icon is gold while GP's is silver, and GP's character model is tinted brown. Their "eyes" are also different; GP's are rectangular with a red light while HD's form a blue chevron.